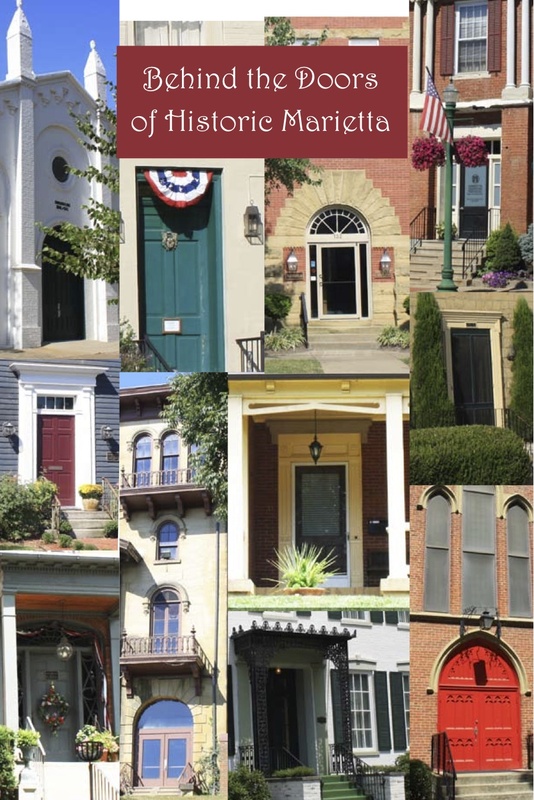 Behind the Doors of Historic Marietta is a user-friendly book that is intended to be a reference for visitors and local citizens. Each page contains a photo and description of the various historic sites. The book includes colorful photos in the center and two essays about earlier times in Marietta. You may use the book as a guide while walking or driving around the streets of Marietta. The map in the back of the book shows places of interest numbered to match the page on which you find the historical information. Enjoy Marietta at your leisure. 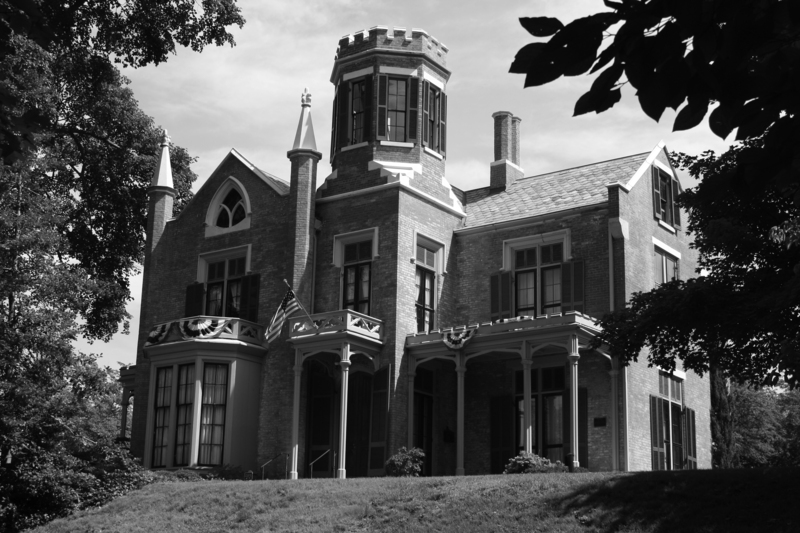 The Castle is one of the best examples of Gothic Revival style architecture in Ohio. Special attractions of the house are the octagonal tower, a trefoil attic window, and stone- capped spires. The front of the property is lined by a cut stone wall and a Victorian wrought iron fence revealing a brick and stone sidewalk on an elevated terrace. The interior features a scagliola fireplace mantle, coodge papier-mache mouldings, and floor to ceiling shutters on the front bay window. John M. Slocomb designed the Castle. Several prominent citizens have called the Castle home. Melvin Clark, a local attorney and abolitionist, began construction in 1855 and continued until 1858 when he sold the property. Later, he lost his life during the Civil War. John Newton, agent for the Marietta Bucket Factory purchased the home. He and his family enjoyed entertaining in the home for over twenty-five years. Edward Nye, publisher of The Marietta Gazette, purchased the estate in 1887, but only lived here a year before his death. The house was passed on to his daughter, Lucy Nye Davis, who was married to Theodore Davis, state senator and president pro tem. Her eldest daughter and heir, Jessie, was fourteen when her mother inherited the home. Jessie lived in the Castle until her death five days before her one- hundredth birthday in 1974. Because she never wanted to leave this house, her funeral was held there. The Castle was renovated by Stewart Bosley and his sister, Bertlyn, and deeded to the Betsey Mills Corporation in 1992, “as a historical asset for the City of Marietta with such asset to be used for educational and public purposes.” Educational programs, tours and special events are held throughout the year. Mound Cemetery square was set aside by early pioneers as a public space to protect part of the extensive earthworks in Marietta. The prehistoric ceremonial-burial mound, named Conus by the pioneers, is 30 feet high and 115 feet wide at its base. Mostly, the remaining earthworks in Marietta are attributed to the Hopewell culture, but many believe the Mound to be the work of the Adenas, an earlier prehistoric people. You can enjoy the view atop the mound by climbing a flight of forty-six hand-carved stone steps and sitting on a park bench. Conus Mound is listed in the Register of Historic Places. Mound Cemetery is said to be the burial place of more Revolutionary War officers than any other single cemetery in the United States. Many war veterans were encouraged by the government to seek lands in the Northwest Territory as a partial payment for service and to bring law and order to the frontier. They came and they stayed. Mound Cemetery came into existence about 1801 when Colonel Robert Taylor, Revolutionary War veteran of Rhode Island, was interred. He was the first of more than twenty-five veterans, including Brigadier General Rufus Putnam, leader of the 48 pioneers of 1788, to be buried there. Burial sites of these men appear on the colorful Washington County Historical Society marker placed near the moat around the mound. The Mound Square is named for Marie Antoinette, in honor of the French queen for which Marietta is named. Rufus Putnam, to who the land had been leased in 1689, gave Square Number 1 to the city of Marietta. When a shallow excavation of the mound was done ad skeletal remains were found, the mound was determined to be an ancient burial site and no further excavations occurred. 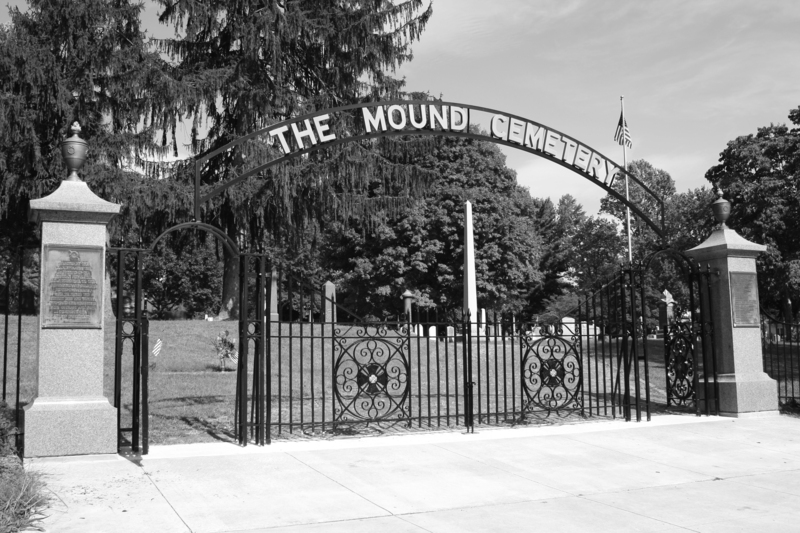 An action by the trustees in 1811 allowed the entire Mound Square to be used as the town cemetery. The area of Mound Cemetery and Conus Mound was the first historic site protected by an act of law in the United States.